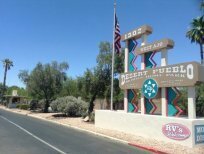 Desert Pueblo is an age 55+ Mobile Home and RV park in Tucson with 77 available spaces reserved for monthly RV parking. We have a low monthly rate for the many amenities our park has to offer! 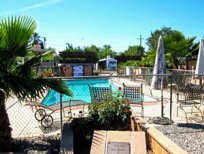 Our well-maintained RV park has a heated Olympic-sized pool, lounge pool, 2 hot tubs, and a sauna that gives residents plenty of ways to relax in the Tucson climate. Some of the other amenities on the drier side include billiards, lighted shuffleboard courts, horseshoe pits, library, and putting green. 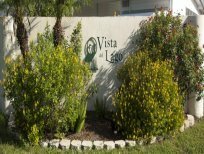 Located in Bradenton, Florida, Vista del Lago is your perfect escape for a seasonal or year round stay. Not only does this Age Qualified community have a great location being close to beaches, shopping, fishing, golfing, museums but it also has a great community amenities including shuffleboard, heated pool, clubhouse, waterfront pavilion and library. Come visit us today to learn why Vista Del Lago is one of the top RV Parks in Bradenton Florida. 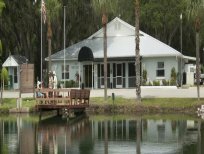 Nestled along the banks of its namesake, the Shell Creek RV Resort is a 55 plus community that provides a relaxing retreat in Central Florida. We work hard to make your life easy by providing a laundry facility, an exercise room and a large bathhouse that's just a short walk from all of our 239 sites. Boaters can take advantage of our boat launch and our 24-slip marina to spend days cruising the creek through the pristine Florida countryside. Anglers can catch bluegill, bass and the occasional catfish in the creek, which they can prep for grilling in our fish cleaning station. We also have a dock on the creek perfect for casting a line or simply enjoying the river view. While the alligators and snakes make the creek unsuitable for swimming, our heated pool and hot tub are open 24/7. If water sports aren't up your alley, you can get to know your neighbors at our bingo games, potlucks, dances, card nights and other social events. Our grounds also feature activities including shuffleboard, horseshoes and billiards. (813) 782-1856, Central FL 37251 Chancey Rd. Located just outside picturesque Zephyrhills, Glen Haven RV Resort is perfectly situated for nature enthusiasts to enjoy the attractions at Hillsborough River State Park. 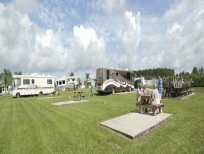 Our RV park maintains 218 full-hookup sites with concrete pads and private picnic tables. Electric is also included in all our rates! We keep the active adults in our 55 plus community busy with aquatic exercise classes, square dances, card games, pancake breakfasts and more. Come spend your days playing at our horseshoes pits, on our shuffleboard and bocce ball courts, or just take a dip in our hot tub and our heated pool. With Tampa just 25 miles away, guests can take a day trips to some of Florida's top attractions, including Busch Gardens. When site size matters, Majestic Oaks is the place to stay in Zephyrhills. Our 252 grassy, full-hookup RV sites measure 40'x70' and can accommodate most big rigs. A 55 plus retirement community, Majestic Oaks features every convenience including an on-site laundry facility, a library, a fitness room and a clubhouse with a separate space for cards and billiards. While cable and wifi are not provided by the park, these services are available for purchase through brighthouse or tengo. The little extras continue on outdoors with equipment for horseshoes, Bocce ball and Petanque. Our shuffleboard and tennis courts are lighted for games that continue after sunset. A vibrant, active community thrives at Majestic Oaks as our guests come together to play bingo, sing karaoke, enjoy ice cream socials, participate in potlucks, or join in one of our jam sessions. When you'd rather relax, go for a swim in our heated pool, take a stroll around one of our three ponds, or spend an afternoon watching the skies for skydivers taking Zephyrhills' renowned 13,000-foot fall. (813) 788-7513, Central FL 37647 Chancey Rd. 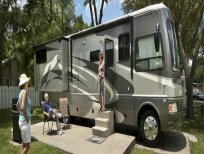 Located just 20 miles from Tampa, Sweetwater RV Resort in Zephyrhills offers a quiet retreat for its 55 plus community. At Sweetwater, you'll find 289 spacious, pet-friendly sites designed accommodate rigs up to 40 ft. Sweetwater's vibrant retirement community enjoys plenty of activities including water aerobics, crafts, barbecues, morning coffee get-togethers and weekly bingo. Guests will also enjoy organizing their own friendly games of horseshoes, billiards and shuffleboard. After all the activity, take a little time to relax in our heated pool. And if you're ever hungry but too tired to cook, there are several nearby restaurants that will deliver pizza or sandwiches right to your RV door. 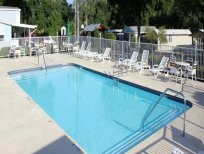 Waters Edge RV Resort provides good old-fashioned fun in the cozy countryside on the outskirts of Zephyrhills. Our 55 plus community offers 217 full-hookup sites available for monthly, seasonal and long-term rentals. Waters Edge guests enjoy chatting around our community campfires, visiting during our ice cream socials and belting out down-home folk songs at our Pickin 'n' Grinnin' group sing-alongs. In season, our entertainment schedule is packed with bingo, potlucks, card games, barbecues, dances and pancake breakfasts. Additional on-site activities available include billiards, shuffleboard and swimming in our heated pool. Guests also enjoy strolling and bird-watching around our pond. (813) 782-5075, Central FL 4150 Lane Rd. Each of the 382 grassy sites at Rainbow Village feature full-hookups and a private picnic table with concrete patios. At our park, we pride ourselves on providing the activities and amenities that allow our guests to socialize with ease. Our calendar is filled with activities like crafts, cards, cruises, potlucks and bingo. In season, we feature monthly entertainment by top name entertainers, and group campfires at our community fire pit. We even have a paved and covered car wash area for your convenience. Our guests enjoy playing shuffleboard, horseshoes, basketball, volleyball, bocce ball and swimming in our heated, covered Olympic-sized swimming pool. For pet owners, Rainbow Village maintains a pet park and dog walking area to accommodate large breeds. Peace of mind is also top priority at Rainbow Village RV Resort in Zephyrhills -- our 55 plus RV park is kept safe with the help of security cameras and nighttime patrols. The central Florida, 55 plus community of Baker Acres has plenty of activities and amenities to keep guests as relaxed or active as they'd like to be. Spend time visiting with neighbors and staging impromptu jam sessions in our gazebo, then go swimming our heated pool. Acquaintances become lifelong friends and neighbors become extended family for the guests and residents of Baker Acres. Community activities include; karaoke nights, dances, holiday celebrations, hymn sings and variety shows. Our guests also enjoy keeping fit by swimming, biking and playing shuffleboard, horseshoes and Bocce Ball. All of our 355 full hook-up sites accommodate rigs up to 40 ft., and have cable and telephone service options (for stays one month or longer) available. Located in cozy Zephyrhills, just 25 miles from Tampa and 60 miles from Orlando, the city offers plenty of local shopping, golf courses and restaurants. Nestled between orange groves in central Florida's rolling countryside, the gated community of Citrus Hill is just six miles from historic downtown Dade City and 35 miles from downtown Tampa. Each of our 182 full-hookup RV sites feature private picnic tables, while some include concrete patios. On-site entertainment options include outdoor horseshoe pits and shuffleboard courts, while inside our clubhouse guests enjoy access to a game room with darts and billiards. Come join our community for bingo, line dancing, potlucks, holiday celebrations, exercise classes, card games, dinners and more. 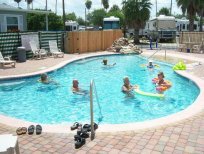 Retire in style at Blue Jay RV Resort -- our 55 plus community located just an hour from both Tampa and Orlando. Our 56 spacious sites feature full-hookups and cement patio pads, perfect for creating a personalized outdoor patio. As an added convenience, Blue Jay provides a small laundry facility and has cable TV services available at all sites. Amenities at our RV park include four shuffleboard courts, billiards in our recreation hall and a heated pool. Our guests enjoy socializing at our many onsite activities, including bingo, potluck dinners and ice cream socials. In nearby Dade City, visitors will find shopping, dining and cultural attractions as they stroll the historic streets - which is also a popular destination for skydivers and host to many car shows. Tucked between orange groves in the rolling hills of Pasco County, Grove Ridge RV Park offers the tranquility of the Florida countryside. Our 247 full-hookup sites each have their own private picnic table, while concrete patios are available on some sites. Our amenities include a heated pool, billiards, shuffleboard and bocce ball, plus a whole host of activities. In season, we pack our social calendar with activities like bingo, potluck dinners, card games, ice cream socials and dances. We even book the occasional entertainer to perform on our stage as an extra treat for our guests. Although we're a rural resort located halfway between Dade City and Zephyrhills, we're close enough for day trips to the amusements in both Tampa and Orlando. (813) 783-3477, Central FL 37811 Chancey Rd. 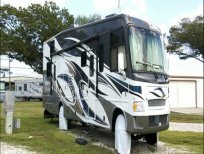 Enjoy the hospitality of Southern Charm RV Resort in the historic Zephyrhills. Surrounded by trees, our 497 grassy, full-hookup sites include concrete patios and private picnic tables. On our picturesque grounds, guests enjoy strolling down the dock to enjoy our water-surrounded gazebo. When guests get ready for a dip, they slip into our relaxing hot tub or jump into our heated swimming pool. Other on-site activities available include sand volleyball, horseshoes, billiards and shuffleboard. Our community's social calendar features group crafts, dance lessons, bingo, card games, ice cream socials and outdoor country star music shows several times a season. Our Tampa area RV Park is also Rally Central - with plenty of space and facilities to handle events of all sizes. Our grounds include a large recreation hall with a kitchen and an outdoor stage. (727) 536-3545, Western FL 11911 66th St. 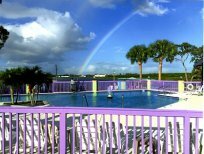 Located in vibrant Largo, the 4th largest city in the Tampa Bay area - Rainbow Village RV Resort provides a peaceful retreat for our 55 plus community. Our 307 well-manicured, grassy sites are spacious enough to accommodate the big rigs, and many also include private picnic tables and concrete pads. We nurture our close-knit community by keeping a busy activities schedule that includes crafts, dancing, bingo, church services, power walking and all sorts of card games. Friends old and new come together playing billiards, shuffleboard, Petanque, bocce ball, horseshoes and swimming in our heated pool. 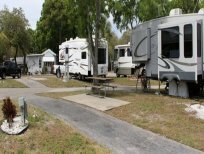 There is no wonder we are one of the best RV parks near St. Petersburg Florida. Call or visit us today to learn more about life at Rainbow Village Largo and how you can start living Carefree! Enjoy full access to a private, 25-acre lake situated in the center of our grounds with a stay at Pleasant Lake RV Resort. Make use of our boat launch to go sailing and freshwater fishing, or cast your lines from our beautiful deck. You can even take the one-mile stroll along the water's edge to view birds and other wildlife found only in Florida, or enjoy a pleasant afternoon at one of our many shore-side picnic tables. The fun continues off the lake with on-site bocce ball, shuffleboard, horseshoes and a heated swimming pool. Our spacious clubhouse features a full kitchen, a billiards room and a library. During the high season, our guests enjoy bingo, Bible studies, potlucks, shows, game nights and ice cream socials, along with classes and clubs including line-dancing, basket weaving, water aerobics and a miniature boat club. 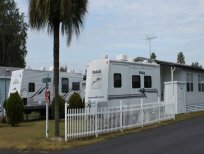 Comfort and convenience are a top priority at our Bradenton Florida RV Park. Our 55 plus community has 340 full-hookup sites with cable TV and Wi-Fi services available. The park grounds also feature two bathhouses and two laundry facilities no further than a half-mile every site. The beautiful Rio Grande Valley beckons you. Consider Palm Gardens, Harlingen, Texas, for your winter destination. Centrally located in the Rio Grande Valley, with many attractions nearby - Gladys Porter Zoo, Iwo Jima Memorial Monument and South Padre Island just to name a few. Other activities such as golf, birding and fishing can be found nearby. If you like to shop we have an outlet mall just down the road, or you can go to Progreso Mexico, which is just 20 miles away. 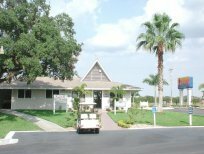 Palm Gardens is the oldest park in the valley, with a combination of mobile home and RV sites. We have many activities like Dancing, Jams, Pot Luck Dinners, Bingo and Game Nights. We also have a Wood shop, Ceramics , Library, Exerice and Yoga, along with Stained Glass classes. Or just hang out at our heated Pool and Hot Tub. There's a dog park for Rover, and "Yappy Hour" is @ 5pm daily. After a busy day, try one of our many restaurants. The local cuisine is wonderful, and all the restaurant chains you're used to are also here. Make the Rio Grande Valley your winter getaway. Become a Winter Texan! Come experience our Rio Grande Valley hospitality - you won't regret it! (888) 464-0431, Eastern TX 1048 N. Alamo Rd. Casa del Valle provides the quality of life you've always dreamed of. Casa del Valle offers unsurpassed convenience to shopping, schools, entertainment and dining facilities. The community is meticulously maintained, and boasts an impressive amenity package that includes two inviting community centers, a beautiful heated swimming pool and spa, shuffleboard courts, planned activities throughout the season and more! We take pride in our courteous, professional management staff, all of whom provide the highest level of customer service to our family of residents. They stand ready to answer your questions and help in any way they can. Why not visit Casa del Valle today and see for yourself what this wonderful lifestyle community has to offer? Allow us the pleasure of helping you fulfill your lifelong dreams! (888) 650-1862, Western FL 17340 San Carlos Blvd. 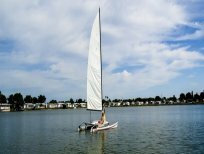 Located only a short bicycle ride to Ft. Myers Beach, and with shopping and dining right next door, Indian Creek is the RV Resort other communities attempt to duplicate. Convenience, amenities galore and activities abound in this tropical paradise. Boating, fishing, shelling, golf, museums, historic homes, nature preserves, dog racing, major league baseball spring training, and much more - it all awaits you just minutes from incredible Southwest Florida. Indian Creek is meticulously maintained, and offers an impressive amenity package for you and your family including three inviting recreation centers, three swimming pools, five tennis courts, nineteen sparkling lakes...the list goes on and on. We take pride in our courteous, professional management staff, all of whom provide the highest level of customer service to our family of residents. They stand ready to answer your questions and help in any way they can. 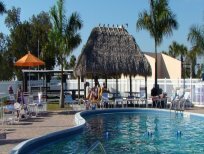 Why not visit Southwest Florida's finest RV Resort today? 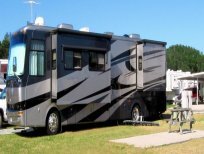 Kenwood RV Resort provides the quality of life you've always dreamed of. Kenwood is situated in a scenic and serene environment, yet offers unsurpassed convenience to shopping, schools, entertainment and dining facilities. The community is meticulously maintained, and offers an impressive amenity package that includes a large, inviting clubhouse fully equipped with kitchen, an indoor heated swimming pool and spa, shuffleboard, billiards, horseshoes and much, much more. We take pride in our courteous, professional management staff, all of whom provide the highest level of customer service to our family of residents. They stand ready to answer your questions and help in any way they can. Why not visit Kenwood today and see for yourself what this wonderful lifestyle RV Resort has to offer? Allow us the pleasure of helping you fulfill your lifelong dreams! (888) 652-6486, Southern FL 1000 Wiggins Pass Rd. Lake San Marino provides the quality of life you've always dreamed of. The community is situated in scenic and serene environment, yet offers unsurpassed convenience to shopping, schools, entertainment and dining facilities. Lake San Marino is meticulously maintained, and offers an impressive amenity package. We take pride in our courteous, professional management staff, all of whom provide the highest level of customer service to our family of residents. They stand ready to answer your questions and help in any way they can. Why not visit Lake San Marino today and see for yourself what this wonderful lifestyle community has to offer? (888) 649-7939, Western FL 19333 Summerlin Rd. Siesta Bay provides the quality of life you've always dreamed of. Enjoy all the amenities and activities of this lushly landscaped tropical resort, just minutes from white sand beaches, challenging golf, historical sites, shopping, houses of worship and fine dining. There is major league baseball spring training, dog racing, world-class fishing and shelling, and some of Florida's most beautiful nature preserves just waiting for you. Siesta Bay is meticulously maintained, and offers an impressive array of amenities, including two large recreation centers, two heated pools, tennis and shuffleboard courts, horseshoes, fishing lakes and more! 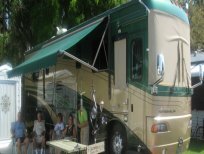 The community is simply the finest RV Resort in Ft. Myers Beach! We take pride in our courteous, professional management staff, all of whom provide the highest level of customer service to our family of Siesta Bay residents. They stand ready to answer your questions and help in any way they can. We invite you to visit Siesta Bay today and see for yourself what this wonderful lifestyle RV Resort has to offer! Allow us the pleasure of helping you fulfill your lifelong dreams! (888) 434-9801, Southern TX 1701 N. International Blvd. This wonderful RV Resort, located only 45 minutes from Padre Island and 10 minutes from Mexico, offers unsurpassed convenience to shopping, schools, entertainment and dining facilities. The community is meticulously maintained, and offers an impressive array of amenities, including a spacious clubhouse, swimming pool, jacuzzi, shuffleboard courts, wireless internet access, numerous planned activities and more! Park your rig in the shade of stately oak trees at Big Tree Resort. Our 55 plus retirement community has 392 grassy, full-hookup sites with concrete pads -- perfect for lawn chairs and personal grills. Come unwind in our heated pool and over-sized hot tub, or spend a few hours on our catch-and-release fishing pond. Our park has plenty of amenities, including horseshoes, shuffleboard, Petanque, billiards and a golf net. Located in Arcadia, near Zolfo Springs Florida, come enjoy strolling along the city's historic, southern colonial streets, or drive an hour south to Port Charlotte for big city entertainment. Those interested in an ocean swim will enjoy the gulf beaches located just over an hour away. In a picturesque oak grove along the Braden River, Horseshoe Cove RV Resort provides guests and residents with a 5-star luxury lifestyle. 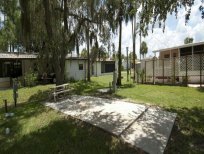 From our 12-acre private island park with its lighted fishing pier, to our nature trails and screened-in picnic pavilion, Horseshoe Cove more than earns its reputation as the highest-rated RV park in Bradenton FL. At Horseshoe Cove, our 475 grassy sites feature full-hookups, concrete pads and private picnic tables. Our grounds feature four laundry rooms, three bathhouses and a dog walk for pet-owners. Rally goers especially appreciate our expansive recreation center which features a kitchen, library, billiards and darts, a sewing room and a card room. Outdoors, our guests enjoy shuffleboard, horseshoes, Petanque and swimming our heated swimming pool and hot tub. During the winter month, we pack the days with community bingo, crafts, potluck dinners, woodworking, billiards, educational lectures, coffee hours, dances, pool parties, movie nights and music. When you want small town charm and exciting attractions, then head to Kissimmee South RV Resort, one of the coziest RV Parks near Disney World! Our 347 sites are nestled amongst tree groves where you just might spy cranes, ducks, turtles and even the occasional alligator. While outdoors, spend a little time playing on our shuffleboard court, horseshoe pits and our challenging miniature golf course, or take a swim in our gorgeous heated swimming pool. For anglers, our grounds feature three catch-and-release fishing ponds. In season, we fill our social calendar with activities including bingo, potlucks, campfire socials, and movies shown with our big screen projector. For your convenience, our grounds features a laundry rooms, two bathhouses and a spacious clubhouse perfect for rally events. Marco Naples RV Resort, located just 10 minutes from the sandy beaches of Naples and Marco Island and the warm Gulf waters stands out from all of the others. Our RV resort offers warm weather and sunny days all year long. The property sits of 23 acres of lush landscape and backs the wetlands of Rookery Bay. Our 305 pull-thru full hookup sites feature 30 amp service with extra parking and storage. On site there are many planned activities most which take place in the recreation hall and pool area. Join exercise classes, crafts, cards, ping pong, darts, horseshoes, shuffleboard and bocce ball. The Naples area is home to numerous world renown golf courses and when residents aren't on the links they can often be found taking advantage of the nearby boating and fishing. The property is also located nearby shopping, restaurants and medical facilities. Find fun and adventure around every corner in the 130 tree-filled acres that is Red Oaks RV Resort. One of the biggest and best Central Florida RV Parks, we have over 1,000 full-hookup sites, spacious enough to accommodate RVs of any size, plus additional spaces that allow for tent camping. Red Oaks is chock full of fun for everyone. Have a musical blast at our line dances, karaoke nights and square dances, or bring your instruments to join our jam sessions. Get to know your Red Oaks neighbors during our quilting bees, bingo games, ice cream socials, water aerobics and more. The fun continues outdoors on our shuffleboard courts, at our horseshoe pits, in our three heated pools and our hot tub. Anglers enjoy on-site fishing at our four retention ponds, and for pet owners, we have a spacious dog park with separate areas for large and small breeds. Rallies are our specialty. Our grounds are well-equipped to accommodate large groups -- including five laundry facilities, seven bathhouses and five clubhouses, with separate spaces for billiards and card rooms. 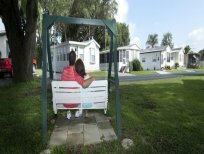 Enjoy peaceful Zephyrhills while staying at Settler's Rest RV Resort. This 55 plus community offers great amenities and activities for you to enjoy while staying in our 25 acre resort. Our 379 full hook-up sites are spacious and will suit most big rigs. And don't forget to bring Fido - our resort is pet friendly! Fully equipped with a two separate laundry rooms, two bathhouses and wireless internet, you can enjoy all the perks of home. If its fun you are looking for, find it in our clubhouse where you can challenge your neighbor to a game of pool or catch up on some reading in our library. 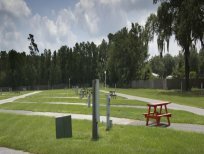 Elsewhere on our grounds, you can take in the warm Florida sun while playing a game of shuffleboard or horseshoes with your friends. Remember, you are never too far from the action while staying with us! Located just 25 miles from Tampa and 60 miles from Orlando, Zephyrhills offers plenty of local shopping, golf courses and restaurants. So come join in the fun and be Carefree! A Senior 55+ Inland Empire Mobile Home & RV Park. Conveniently located in beautiful Yucaipa, CA, our mobile home & RV Park is the perfect place to call "home." Whether moving in long-term or just visiting beautiful Southern CA for a short time, Valley Breeze MHP is a welcoming community where you'll feel right at home. Stay tuned for lots of updates and improvements happening at Ocean Breeze. During construction, the park does have a limited number of RV sites available. Please call the office for more information. Improvements will include a new clubhouse, welcome center, state of the art exercise facility, and swimming pool. In addition, Carefree plans to expand fitness, community, wellness, and learning activities for its guests and residents. Florida beaches and ocean breezes combine to create those vacation memories that urge you to plan return visits. Walks on the beach at sunrise with water lapping at your feet as you listen to surf crashing nearby. Re-live those experiences every day at Ocean Breeze - Jensen Beach Carefree Resort. Wake up to the sound of the Atlantic Ocean's crashing waves on the beach as the sun rises on another beautiful day. 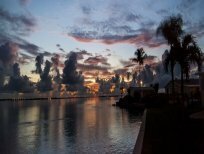 Located just north of West Palm Beach on the inter coastal waterway, Jensen Beach is a century old riverfront town with "Old Florida" charm. This community was recently named one of the top places to retire in the United States. Looking for Islamorada RV Parks? Well look no further! Conveniently located right in the middle of Miami and Key West, Sea Breeze RV Park is the perfect place to experience all of the amazing things Florida has to offer. 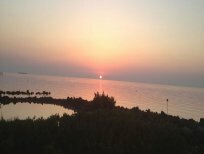 Our beautiful resort sits right on the shores of the ocean, so you'll have access to breath taking sunrises and sunsets every night and day, right outside your RV. Interested in fishing? Well Islamorada is commonly known as the sport fishing capital of the world and is rumored to have the biggest fishing fleet per square mile compared to anywhere else! Plus, the best part of all is that you'll never have to go far to reel some in since Sea Breeze has it's very own shore-side fishing with fish cleaning facilities, as well as a boat dock and ramp. Included are also numerous other amenities like tiki hut picnic areas, an ocean tidal pool, and even a dog beach for your favorite furry friend! Not far from the park you can also find Hen and Chickens Reef, a living coral reef marked by a gorgeous lighthouse teaming with tropical reef life. Along with water life, Islamorada also has an abundance of Flora and Fauna. Their incredibly unique ecosystem has an array of tropical and migrating birds, like fancy white egrets or blue herons. So grab your snorkel or binoculars and start sight seeing! (480) 986-0220, Central AZ 9421 E. Main St.
(866) 340-0649, Southern FL 800 N. E. 48th St.
(928) 754-3438, Western AZ 350 Lee Ave.
(623) 979-6988, Central AZ 10960 N. 67th Ave.
(520) 836-6722, Southern AZ 1409 N. French St.
(520) 836-9031, Southern AZ 2200 N Trekell Rd.